Regional specialties take the spotlight as New England and New York (really New Jersey) face-off: who wins, Manhattan or New England clam chowder? 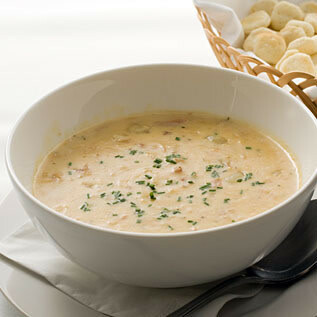 Chowder comes from the French word chaudiere, a type of cauldron; fans of creamy New England style clam chowders like this one look down on tomato-based Manhattan clam chowders as second rank. Everyone knows that a proper celebration of Super Bowl Sunday can’t focus on football alone. An ample – maybe even outrageous – amount of food is imperative. Usually it’s a spread of American bar and rec room classics: chips, dips and a few chopped raw vegetables if you’re in an especially health conscious crowd. The fanciest recipe might be nachos. Guacamole is a must. Gigantic bruiser-sized men will slug it out on the gridiron (or, for most of us, our flat screen HD-TV), led by Eli the N’Orleans boy versus Tom, the Supermodel’s husband. But the true test of bests will be between the culinary specialties of the two regions the teams represent, New England and New York. Or, to be more accurate, New England and the NY metro area, including New Jersey. The Giants do in fact play in New Jersey, and the poor little Turnpike – I mean Garden – state really should get its due. In that spirit, the food face-off I envision for Super Bowl Sunday would allow a regional alliance between big-name New York and humble Jersey. A combo New York/New Jersey platter would be fine indeed. Gimme a NY slice (thin crust, eaten folded, no fork), a Coney Island dog, and…some farm fresh Silver Queen sweet corn from a roadside farmstand in New Jersey. There are in fact rural roads in Jersey; it’s not all turnpike. But this time of year, the corn ain’t exactly knee high. So for the Jersey course, we could move on to dessert. The New Jersey boardwalk salt water taffy is fresh year round. How about a Super Bowl dessert competition: Atlantic City boardwalk taffy along with New York cheesecake, versus New England’s Boston Cream Pie? Hard to pick a winner. Even harder to pick a winner between the two region’s chowders. Having both would be a good solution, and a good meal for the big day. New England clam chowder is cream-based, Manhattan clam chowder is tomato-brothy. Both include potatoes, onion, and bacon or salt pork. But in an attempt not to play favorites, and to simply let the clams carry the day, here’s a clam chowder that is neither New York red nor New England white: a brothy “pure” flavored Creamless Clam Chowder from the book Gourmet Today. Bring water to a simmer in a 2- to 3-quart heavy saucepan. Add clams and simmer, covered, until they open wide, 6-8 minutes; check frequently after 6 minutes and transfer opened clams to a bowl. Discard any that have not opened after 8 minutes. Remove pan from heat; reserve cooking liquid. Heat butter in a 3- to 4-quart heavy saucepan over moderate heat until foam subsides. Add onion and garlic and cook, stirring occasionally, until softened but not browned, about 6 minutes. Add potatoes, celery, carrots, bay leaf, 1/2 teaspoon salt, and 1/2 teaspoon pepper and cook, stirring occasionally, until vegetables begin to soften, about 4 minutes. Add wine and simmer until liquid is reduced by half, about 5 minutes. Add bottled calm juice, bring to a simmer, and simmer covered, until vegetables are tender, 8 to 10 minutes. Remove bay leaf. Transfer 1 cup soup (with vegetables) to a blender (use caution when blending hot liquids) and puree. Stir puree back into soup. Stir in parsley, chopped clams, reserved clam cooking liquid, and salt and pepper to taste and reheat gently (do not simmer). Note: soup can be made a day ahead; cool, uncovered, then refrigerate, covered. Reheat gently before serving. From Gourmet Today, editor: Ruth Reichl.